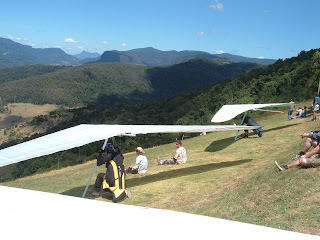 Dave & Inge Down Under: Canungra Classic HG Comp - watching only..
Last friday I went to Beechmont to watch the HG competitors launch and go cross country. I was still suffering from jatlag and flu so there was no way I could have flown in the competition. This is a photo of the crowded launch site. 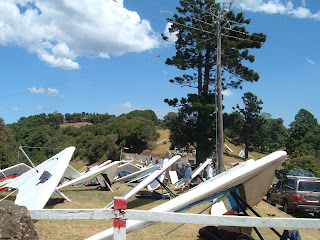 There was more than 50 hanggliders competing. It really is a beautiful spot to fly. 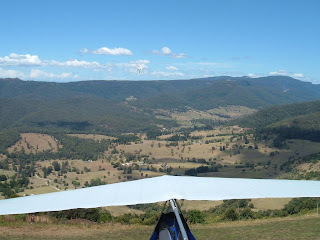 The goal was to fly to a lake near Boonah, some 99kms away. 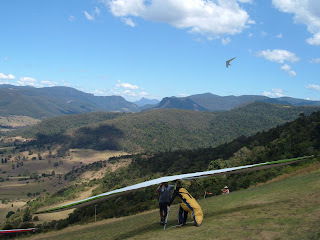 I believe almost 20 gliders made it there. Oh well there's always next year.